A method of phytosterol conversion into 9α-hydroxy-androstenedione under high loads of steroid substrate has been developed with the use of mixed cultures of the actinobacteria M. neoaurum and R. erythropolis. The introduction of a 9α-hydroxylating culture after the first 70 h of conversion made it possible to increase process selectivity and to exclude the use of methylcyclodextrin, which is expensive and difficult to regenerate. 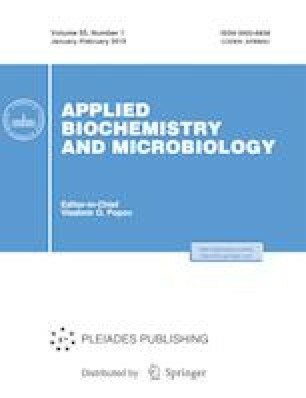 The work was supported by the Program of the Presidium of the Russian Academy of Sciences “Development of New Biotechnology Techniques for the Integrated Scheme of Obtaining Highly Active Anti-inflammatory and Antiallergic Fluorinated Corticosteroids from Phytosterols via 9α-hydroxy-AD with the Newly Formed Immobilized Biocatalysts Used in the Process of Bioconversion” (project no. 1201371077).